Grilled Chicken Recipes that are quick, easy and healthy for you. Combine the chicken, 1 tablespoon Grapeseed Oil, 2 teaspoons Garlic Galore Blend, and Smoked Mozzarella Blend; marinate 30 minutes. Preheat heat grill or grill pan to medium heat. Toss the bell pepper and zucchini with remaining 1 tablespoon Grapeseed Oil, salt and pepper. Start grilling the chicken, bell pepper, and zucchini. Cook until vegetables are tender and chicken is cooked through. Meanwhile bring the Vegetable Bouillon to a boil. Add the quinoa, reduce heat to a simmer, cover, and cook for 10-15 minutes or until liquid is absorbed and quinoa is tender. Right before serving mash the avocado with lemon juice and remaining ½ teaspoon Garlic Galore and slice the belle pepper into strips. Serve the chicken, bell pepper, and zucchini over quinoa. 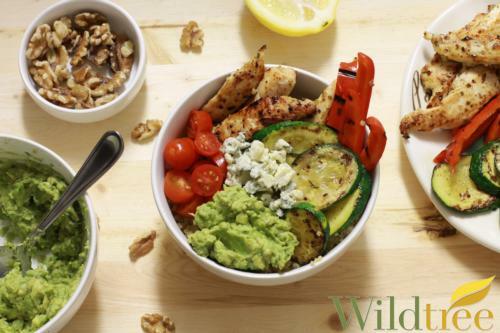 Top with avocado and walnuts. Top with feta or blue cheese if desired. Combine the olives, capers, red onion, 1 teaspoon Mediterranean Rub, Garlic Galore, lemon juice and ½ tablespoon Grapeseed Oil; refrigerate until ready to use. 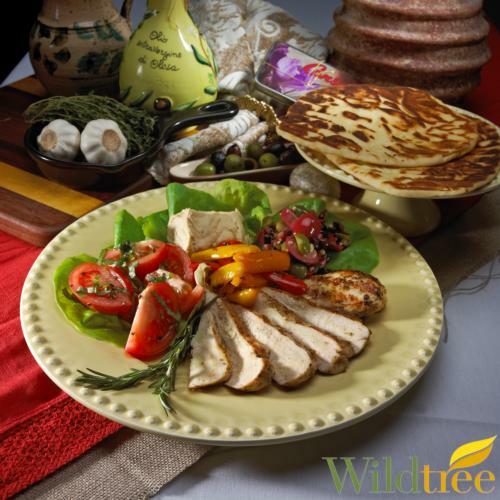 Combine the chicken with remaining 2 teaspoons Mediterranean Rub, 1 tablespoon Grapeseed Oil, and red wine vinegar. Marinate at least 20 minutes. Heat grill or grill pan to medium high heat. Grill chicken until cooked through. Meanwhile combine the Vegetable Bouillon, couscous, and remaining 1 tablespoon Grapeseed Oil in a saucepan. Bring to a boil. Reduce heat to a medium boil, cover, and cook for about 10 minutes or until all the liquid is absorbed and couscous is tender. 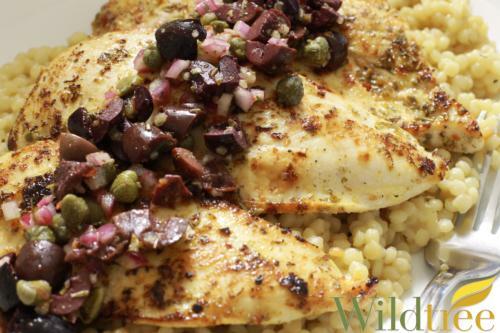 Serve chicken over couscous and top with olive tapenade.